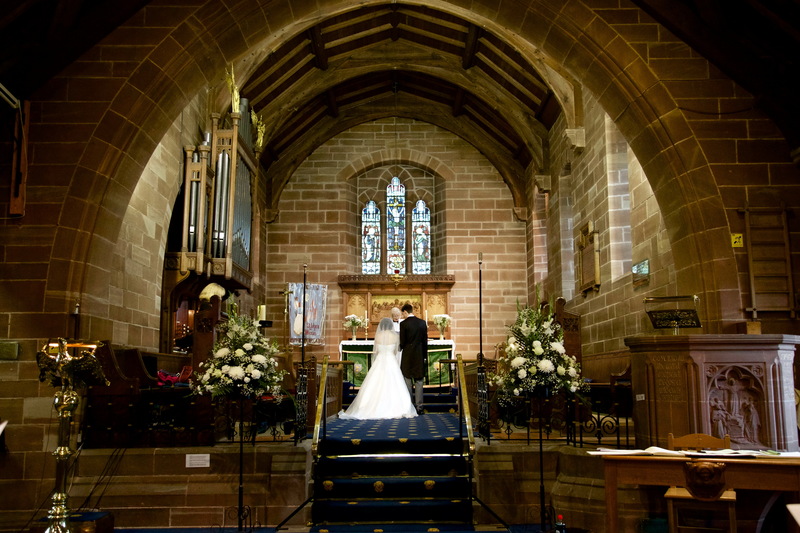 Weston is claimed to be one of the most beautiful churches in Cheshire. It’s style is Geometric Gothic which was first popular in the second half of the 13th Century. The beauty of this building comes from the blending of the lo­cal “Runcorn Pink” sandstone with the golden woodwork. It is sometimes called the ‘Choirboys Church’ since some of the money for the building was raised by choirboys writing thousands of letters to prominent people asking for donations. The Organ was donated in response to one of these letters. It was consecrated on 11th May 1898 and the Spire was added in 1900. It is now a listed building. 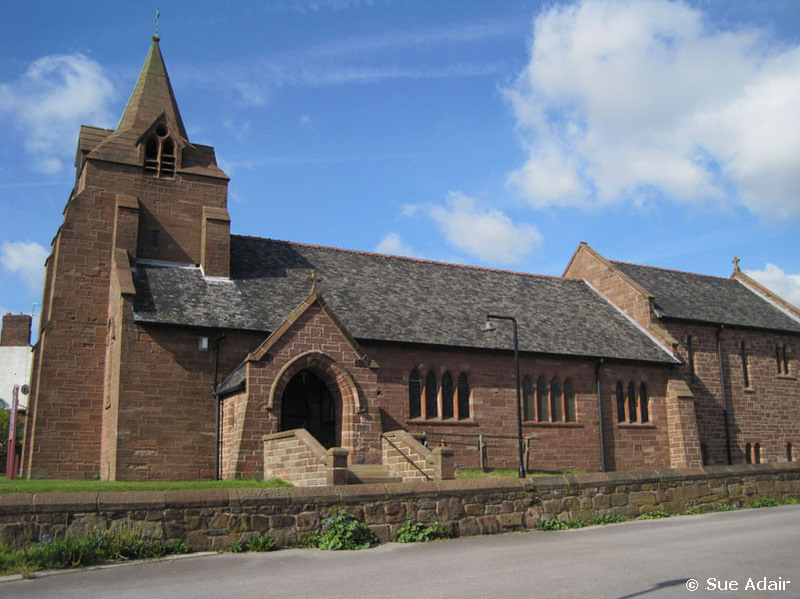 It has a seating capacity of 150 (maximum 200) The church was at first a daughter church of All Saints, Runcorn. Weston Parish was created in 1930 and has grown to a population of more than 4000. This window consists of two panels surmounted, between, by a circular light, and is a memorial to the Rev. Frank Cartwright, Vicar of Weston from May 1963 to May 1968. The design depicts the Diocese of Worcester where the Rev. Cartwright received his training in Theology. All his Ministry was done in the Diocese of Chester which is also depicted in the design. The window was designed by Miss T. Cox, F.B.S.M.G.P., of Chester and was dedicated by-Canon S. May on 13th June 1970. The cost of the window was raised by public subscription. The circular light portrays St. Werburgh’s geese, the pilgrim badge of Chester Cathedral in the Middle Ages. The left hand panel has the badge of the Diocese of Worcester, below which is depicted St Wulfstan of Worcester with, in the background, the shield of Edward the Confessor. Below again is King William and Archbishop Lanfranc opposing Wulfstan whose crozier rests on the tomb of Edward the Confessor. The right hand panel has the badge of the Diocese of Chester, below which is depicted St. Werburgh of Chester and below again is St Werburgh being received as a Novice by the Abbess, St. Etheldreda. St. Wulfstan of Worcester was made Bishop in 1062 having been nominated by Edward the Confessor. After the Norman Conquest King William and Archbishop Lanfranc tried to depose him. Lanfranc was won over by the simple goodness of Wulfstan. In later years the two men suppressed the slave trade between England and Ireland. Wulfstan rebuilt Worcester cathedral. St Werburgh of Chester was a Princess, the daughter of the King of Mercia. Eventually she became Abbess of the Convent of Ely where she had originally been received as a Novice. The care of several Abbeys was entrusted to her. One legend tells of her rescuing wild geese from being eaten and this small act of kindness has been used as a symbol of her life. Because of the Viking raids the shrine of St Werburgh was moved to Chester in 875 AD.